Winters in our Natural North Florida region are never harsh or especially cold. For the most part, it’s shorts and short-sleeve weather. However, the Suwannee County Chamber of Commerce wants everyone to get in the Christmas Spirit and are again (for the 34th year!) hosting “Christmas On The Square“, Nov. 29 and 30 and Dec. 1 in historic downtown Live Oak. Events at this year’s festival start at 5:30 PM on Thursday afternoon, with a tree lighting and fun run. Friday’s events last from 4 ’til 10PM and include arts and crafts vendors, as well as the FIREWORKS finale. THERE WILL ALSO BE OVER 30 TONS OF MAN-MADE SNOW on hand to give the event some holiday spirit. 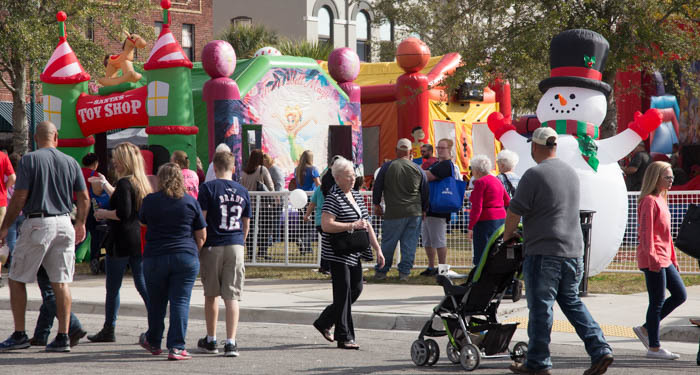 Saturday’s events begin at 8AM and last until 4PM, and include a car show and one of the largest Arts and Crafts shows, with vendors from all over the U.S. At 6PM on Saturday, the weekend will close withe the ANNUAL LIGHTED CHRISTMAS PARADE. Live Oak is located at the intersection of US90, US129 and is just south of Interstate 10, just a few miles from the Georgia/Florida line.